We have two superb Sicilian chess finishes for you to find today. 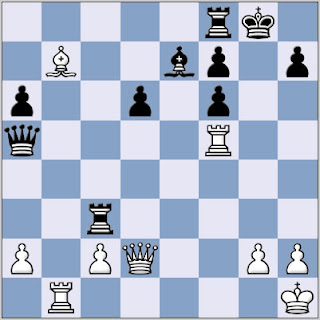 The first is Maric vs Gligoric from Belgrade 1962, and it's a Najdorf Poisoned Pawn game (1 e4 c5; 2 Nf3 d6; 3 d4 cd; 4 Nxd4 Nf6; 5 Nc3 a6; 6 Bg5 e6; 7 f4 Qb6; 8 Qd2 Qxb2). The super risky Poisoned Pawn variation was all the rage in the 60's and 70's, even being ventured by Fischer in his world title match with Spassky, but is seldom seen in top level chess nowadays. How did Gligoric, playing Black, force a win on the spot from this position? Our second game, Nunn vs Murshed from London 1985, is another typical Sicilian, sides have castled on opposite wings and both launched potentially mating attacks. 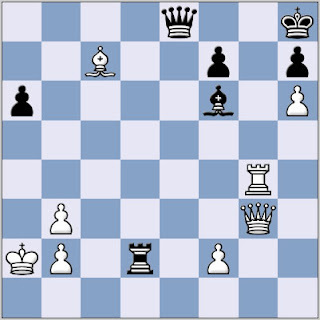 Black's last move (... Rd2, threatening ... Rxb2) appears devestating, but Nunn, playing White found a spectacular winning move, can you find it? You can find both these games, and a host of other fabulous Sicilians in Nesis's book, "Tactics in the Sicilian "
Answers to roger AT 21thoughts DOT com. The solutions will be published on Wednesday.